Our laminated pocket medical cards fit perfectly in a scrubs or lab coat pocket and provide the most important information on specific topics in a clear and concise manner. These practical, sturdy, easy-to-read reference cards are a must for the medical professional or interested lay person. 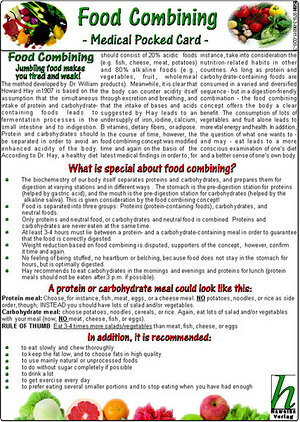 The Food Combining card provides an overview of the history and theory of food combining and its benefits for the body. In addition, it provides suggestions for a protein or carbohydrate meal, tips for healthy digestion and recommended and not recommended foods. Size: 4.1" X 5.8"